Archived Posts, Books, magazines, etc., Liberal, USA companies behaving badly, politics, racism, USA. permalink. My first thought was that the cartoon is so obviously silly that it couldn’t come across as serious (I mean, an American flag burning on the fire? OBL’s portrait on the mantle?) But then, they print Mallard Fillmore every day in the paper. “It’s funny because it’s true!” Is generally a weak punchline, and it’s certainly not the punchline that defines satire. But that’s the punchline here, even if you accept the defense’s reading. This is probably a stupid question, since I don’t know the political tendencies of the newspaper, but is the picture supposed to criticize Obama or at the contrary the way Obama is presented in some media ? Hum ok, I might be a bit st00pid, because I didn’t realize it was on the cover on the newspaper, which makes things a bit different. That it’s not obvious to those who aren’t familiar with the magazine is exactly the problem. The picture is nothing more than a poorly executed in-joke; the only way that it’s obviously mocking the way that Obama is presented in the media is if you know that the New Yorker is a liberal magazine (and therefore presumed to be in support of a Democrat president). You also have to ignore, or be unaware of, the way that the liberal media has used racist imagery in the past — often when they are trying to show “support” for PoC — the more recent of which has involved the Obamas. Uh, what? The New Yorker should have refrained from running this image because it’s racist. The fact that the only people who “get it” are the ones who would get it even without the cartoon is just one more reason why, despite claims to the contrary, the picture is not satire. I don’t agree that it is intrinsically racist, it depends on the context. Now the problem is that there was none (if it is just like this on a cover), but I don’t think it would have been problematic if it had been inside, next to an article on, e.g, right-wing false accusations of Obama which clearly supported Obama. My friend said this was “obviously” satire because of the fist bump, which is alluding to the ridiculous Fox News report in which they referred to that gesture as a “terrorist fist jab.” She then said it’s probably not obvious to people who haven’t seen that news report. But… I saw the news report, and I didn’t “get it” either. I thought it was just plain racist at first glance. Then again, maybe my viewpoint was influenced because I saw it on this blog first? I don’t know. 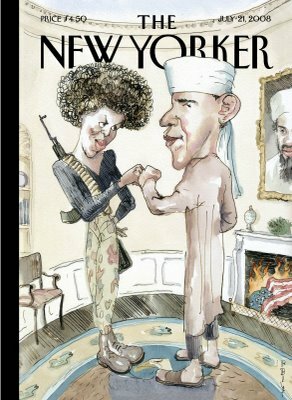 To me, this image mocks the absurdity of the suggestion that the Obamas’ fist pound makes them terrorists. Some people won’t understand the context, but does this make the image itself racist? Satire directed an an audience that doesn’t get it is still satire; in fact a lot of satire has the characteristic of being completely misunderstood by at least some of its audience, including Swift’s “A Modest Proposal.” The problem with the New Yorker cover isn’t that it’s not satire. The problem is that a magazine cover is going to reach too many people who will approach the cover without the context necessary to understand it, and the New Yorker should have weighed that against the cover’s value as satire. I agree that the New Yorker cover deserves criticism. I also think that it was satire, however inept.